As part of a series on “Recommendation Markets”, I want to propose a variation on bonding curves used in “Curation Markets” that allow for verification of curation. Only when verified, can the curators earn a tokenized reward. A ‘Recommendation Market’ emphasises that a “Curation Market” is only there to produce signals, not the truth. In other words, the economic value produced from the curation serves only to provide a recommendation. In a “Recommendation Market”, some additional vetting process is applied to determine if the staked rankings are meaningful. It results in the protocol serving the users, not the users serving the protocol. Projects like Ocean Protocol, DAOStack & Relevant use variant forms of this verification system, the core part being: there’s an additional vetting process to the staked, economic, curation game. This article gives an example of how to reward curators through a token bonding curve, if, and only if they do curation work deemed useful. A Graduating Token Bonding Curve. The variation of the design is that you have two tokens in a bonding curve: one for the buy curve & one for the sell curve. A “buy” token that is bought from the curve needs to undergo a verification process to graduate to a “sell” token that can be sold. Only “sell” tokens can be sold to get back the collateral from the bonding curve. If you have a “buy” token, you have to participate in curation in order to get the token to be graduated to a “sell” token. In other words: you can only sell back into the curve and get a reward from the collateral, if you have a token that has been verified and graduated. In order to graduate a token, a user has to stake information to a piece of content in order to rank it. A verifier then looks at the ranked recommendations. The top recommendation would not necessarily be the most meaningful, because in a “Recommendation Market”, it only produces signals, not the truth. The verifier would then pick and graduate from the list, valuable information to them in that context. In doing so, ALL staked tokens to that piece of content graduates to “sell” tokens, upon which they can be sold for a reward into the bonding curved collateral if deemed necessary. The verifier can be anyone or anything. It could be one human, it could be a DAO, it could be 2/5 multi-sig, it could a bot, it could be an oracle, anything. Through this verification process, the verifier can optionally be rewarded for doing verification (if it’s necessary for that use case). 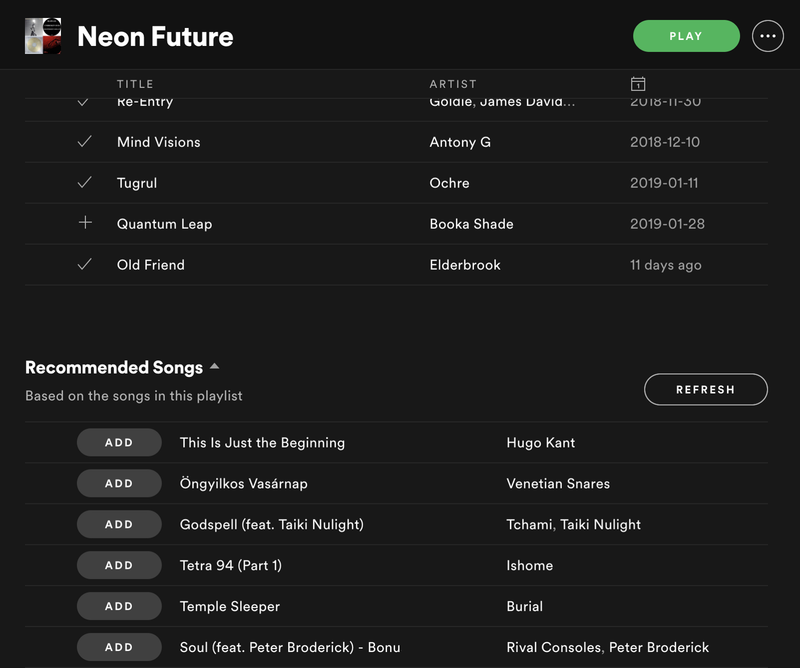 Spotify is really great at recommending songs, but what if this was replaced with a “Recommendation Market”? Every playlist would have its own token, upon which users can buy the playlist’s token on a bonding curve and help recommend songs to it. The playlist owner can then listen to each recommendation and then choose to add it to the playlist. Upon selecting to add it to the playlist (if they think it fits), the token graduates to a “sell” token. All those who staked on that specific song that has been chosen would have all their tokens graduated to “sell” tokens, proving that useful curatorial work was done. This opens up interesting avenues for music curation & music funding. There can be one playlist owner, just selecting music for themselves from the market, having fun. This could evolve into something that looks like a decentralized label of sorts. A group of people (label owners) could choose to to optionally fund musicians who had their music selected. The musicians themselves would also then earn “sell” tokens, creating networks on patronage. Examples: Open Source Tasks & Funding Maintainers? One of the struggles of remote, open source coding is that if there’s not a key product manager, it’s hard to figure out how to prioritise tasks. A “Recommendation Market” on issues could be extremely meaningful in this context, allowing participants to rank features, issues and bugs. A maintainer could pick and choose to graduate issues to work on, rewarding curators for their service. In doing this maintenance, the maintainer can also earn from doing this work (if the graduating also earns them tokens). Through this, open source projects can more effectively use its long-tail of contributors to help coordinate around work online & remotely. A variation on graduating token bonding curves is to add multiple graduations before it could be sold. It can follow the traditional development life-cycle. Only once the token has graduated several stages to “implemented” does it turn into a “sell token” in order to claim a reward from the communal collateral in the bonding curve. Examples: What Links Should I Read? This is a variant on a personal attention economy. Users would buy a personal token of someone. In doing so, they choose to rank articles or links they think that person should read. If that person reads it, the verifier (the person) earns some tokens and also graduates the curators tokens to “sell” tokens. Thus, the goal of the curators would be to send you link you think would be interesting to read. Adding a verifier to a curation market does add its own complexities. In some circumstances, it might become profitable for certain token holders to bribe the verifier in graduating tokens. It is thus important that the verifier is correctly incentivized and thus variations of graduating token bonding curves need to be explored to determine if this is a serious issue. If a verifier is caught being bribed however, it will likely lose interest from curators if it’s clear that their work won’t be honestly rewarded. “Recommendation Markets” serve to produce novel information signals using crypto-economic incentives. It seeks to help verifiers choose information, and in doing so, rewards the curators for helping them. In this article, I demonstrated what this would look like with the introduction of a graduating token bonding curve. A token that is bought needs to be verified & graduated to a “sell” token in order for the curators to earn from the work they have done. I hope this model provides an interesting variant on bonding curves that more directly reward curatorial work, is kinder on users and that allows for these ideas to be implemented sooner, rather than later.